I am embarrassed to admit that, even though my dad was born in Scotland and the majority of his family still lives there, I am woefully ignorant of Scotland's history. Sure, I've seen the movies and read little bits here and there, but I've never actually read a book that dives right in and gives me a comprehensive view of the rulers, wars, struggles and successes that made Scotland the country it is today. It is for this very reason I decided to read A King Ensnared, the story of James Stewart's early life and imprisonment in England. The story begins with young James Stewart - the future James I, King of Scots - learning that his older brother and heir to their father's throne has been starved to death while being detained by his Uncle, the Duke of Albany, who wants to rule Scotland himself. James, now in danger as the heir, is spirited off by men loyal to the crown in the hopes of getting him to France where he can stay until he is older and it is safe for him to come back to Scotland and fight for his rightful place. However, on the way to France they are taken prisoner by English pirates and given over to the English king as prisoner. And so begins James's 18 year imprisonment, 16 years of which are discussed in this book. A lot of time passes in this relatively short book and I found the first part to be somewhat slow going. So much of it deals with James in prison, trying to find something to occupy his time and energy while he awaits his release or, if it presents itself, his escape. What I did find interesting during this part was the way JR Tomlin described James's loneliness, isolation and disgraceful and humiliating treatment, far below what a rightful King should experience. He literally grows up behind bars, with no parents, siblings and only a few men loyal to him as companions or advisors. He is given a decent education by the English and doesn't seem to have been physically harmed in any way, but the mental anguish is a lot for a young man to deal with while also trying to find a way to get out of his imprisonment and, once he does, bring down his uncle and put his country to rights. It was very interesting to get an in depth look at how a noble captive of the English would have been treated during this time and that kept me turning the pages while I waited for something exciting to happen. The real action and progress started when James and Henry V, King of England, begin their mental battle, each trying to outwit the other to get what they want, and when James fights under Henry in England's battles against France. At this point James is older and fully capable of ruling Scotland if he could get Henry to release him. But what Henry asks for is not only James's help in defeating the French but complete fealty to him. That is something James cannot agree to and therefore each continue to negotiate. While James isn't released in this book (I believe this is meant to be a series so hopefully that will happen in the next book) he does learn much from the brutal and vicious Henry V on the battlefield that he could definitely use in the future as King. The descriptions of war were very vivid and exciting and, much to my surprise, my favorite aspect of the book. Another aspect I enjoyed, although it was somewhat brief and interspersed through the second half of the book, was the growing romance between James and Lady Joan Beaufort, an English noblewoman who I believe will become his wife. It showed a tenderness and softness that was a nice contrast to the hardened, cunning aspects of James that he had to present most of the time. The traditional Scottish words thrown in also helped the story flow for me, making the dialogue seem more genuine and intriguing. The one thing I don't feel I got with this book was the in depth history of Scotland I was looking for. While I got to learn about James I and some of the political machinations between Scotland, England and France I just wanted more about Scotland. I am hoping that this will be accomplished with the future books in the series as I really came to like James and would love to see how he integrates back into his native country and how Scotland fares until his rule. It's okay. I enjoy the blue, stark depiction of the cell and the shining light (hope? freedom?) that James is bathed in as well as the way he longingly looks out towards the world beyond his imprisonment. It fits the book perfectly it just doesn't jump out at me and say "pick me up and read me!". 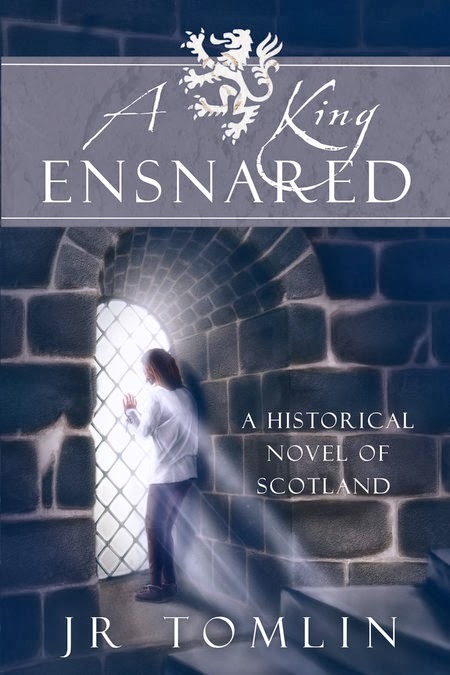 Be sure to come back tomorrow for a guest post by author JR Tomlin and the chance to win a copy of A King Ensnared! Thanks for the review! Writing about someone who is imprisoned and thus, by necessity, somewhat in passive position was challenging. Your comments on the cover were also interesting. It wasn't the cover I originally intended to use because the art wasn't ready in time. You will see that on the sequel when it comes out in April.